The Marathi review of JTHJ got very huge response and some of my friends insisted that I should try & write in English/ Hindi. Well, I have tried translating my own review into English to start with. Here it goes.. Nothing wrong in considering yourself wise and sometimes even considering other person a fool is also acceptable, but when one starts considering himself an outright wise & ever every other person a fool, then what gets created is Jab Tak Hain Jaan with the so called King Khan SRK in the lead role of a filthy-beard army Major; who & who's team don’t even care to have a Army Hair Cut, they have one task agenda of Bomb Diffusion and come what may they always manage to get a Bomb a Day for daily bread. To match with such a creation, celebrated AR Rahman steps into the Sajid-Wajid shoes, legendary lyricist Gulzar's words - when understood - seem Sameer-type and Late Yash Chopra - one of the greatest filmmakers in the industry - in his last venture delivers a totally forgettable epic. Film begins somewhere in a Market area of Leh, where the forces have detected an explosive. A member of the Bomb Squad is trying to diffuse it, but of course he is not going to succeed because the Hero has to enter the scene. 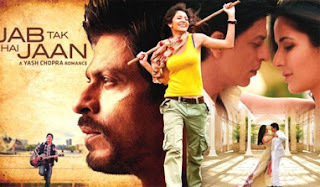 In comes Major Samar Anand (Shahrukh Khan), who has thus far done it 97 times successfully! He comes and with an incomparable ease he plucks and cuts wires and disables the explosive and all the SRK worshipers elate! Whoa! That’s not the only greatness, he has done this time & again without a Protection Suit! (You are not supposed to ask how does army allows it Because You Are Fool.) The Major has a poetic habit of spending some time with self somewhere in a quiet place after every Bomb Diffusion. So he goes to a nearby Lake for a night out. In the morning there comes 'Akira' (Anushka Sharma). She doesn’t bother looking right or left and simply removes all her clothes except the very necessary and dives into the cold water for getting drowned and for the hero to save her. He, after she regains consciousness, gives his jacket to her with his private diary - containing his life story - neatly placed in it for her perusal. But then, as they say "Ishq Roke Rukta Nahin", the twosome do come close to each other, do what SRK never did on screen (Physical Romance - Imran Hashmi type) and then Samar meets with an accident. He comes back from the jaws of death. Here, Meera realises that this is the punishment Jesus Christ gave her for breaching the oath. So, for Samar to live a safe & long life, Meera breaks the relationship & tells Samar to leave London! (LoL!!) In 22nd century, understanding Meera's view-point is the limit of your foolishness, but still you relate with it Because You Are actually Fool! Hello! This is all happening in Flashback! Did you forget 'Akira' is reading Samar's Diary? Well, that's precisely what happens with the Director too! He gets lost in the Flashback till the Diary ends. Let it be! Projector of the diary, Akira, works in Discovery Channel as a junior someone. She has a dream of shooting a documentary on Army, Bombs, Wars, etc. She gets clearance for it and straightaway joins the bomb squad with a camera and inner-wares. With a Professional video shooting camera, which has don’t know what power Optical Zoom (I am an camera illiterate. ), when she captures Samar's Bomb Diffusion activity from a One Foot Distance; you start relating with her feeling that she is also a Fool. No matter, how stupid you are, you already know that this Tom-Boyish Akira is going to fall for the Major, she does. But that’s not all. She films the Documentary on Samar himself - "A man who cannot die!' Discovery Channel people love it, they cry ! And order Akira to bring Samar to the London H.O. Breaking the promise given to Meera 10 years back, Samar comes to London; again meets with an accident and the 10 years of his life get wiped off. His life is rewinded to 10 year back era ! (This is perfectly possible. B. Y. A. F.) To bring him back in 2012, his doctor, Akira, Meera and his London Based Lahori friend decide to fool around him. (instead of you this time, for a change) After a lot of Melodrama & Shahrukh-ism, your 'Jaan' is spared and the film ends ! hushh !! Nobody thinks that the Documentary shot on Samar can be shown to him to bring him back, but you have to accept & understand B. Y. A. F.
Unfortunate to say that Late Yash Chopra has given his worst in his last. Aditya Chopra's Story-Screenplay, he must have written in school days. Gulzar Saab & Rahman are advised to immediately disown all their JTHJ creations. IT would be great for his own worshipers, if SRK overcomes his narcissism. Expecting Katrina to act is in vein. B. Y. A. F. ! !